One of my earliest political memories is of something nebulous and complicated that was going on when I was 6 years old called “Watergate”. In August 1974, I remember being shushed as my extended family gathered around a TV in my Aunt Adele’s living room to watch President Richard Nixon give his resignation speech. I had hippie uncles on both sides of my family who made underhanded comments about the President and his lies and his war; I had conservative parents who not only voted for Nixon, but actively worked to re-elect him in 1972. So though I am barely able to remember it, we were living right smack in the middle of “NIXONLAND”, right there in our own family. 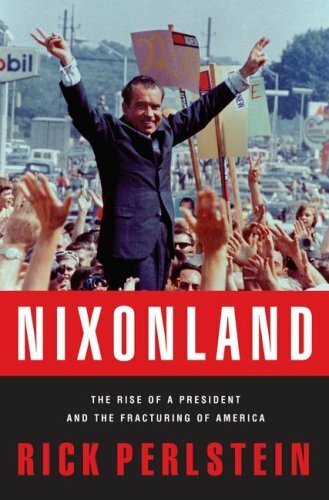 I knew I was eventually going to be reading Rick Perlstein’s 750-page nonfiction history of Richard Nixon and the times he presided over & helped to stoke/flame, from the moment this book hit the bestseller lists and I found out about it. Perlstein wrote my favorite book I read all of last year, and one of the best pieces of history I’ve ever read: “BEFORE THE STORM: BARRY GOLDWATER & THE UNMAKING OF THE AMERICAN CONSENSUS”. You can read my review of that book by clicking here. This book picks up more or less where that one left off, after a few chapters about Nixon’s childhood and rise to power – his Vice-Presidency under Eisenhower, his loss to Kennedy for the presidency in 1960, and his premature exit from politics soon thereafter (the famous “you won’t have Nixon to kick around any longer”). More importantly, these early chapters are not a rote recitation of biography, but set up the dichotomy that Nixon exploited time and again his entire career: the resentment felt by the common, “left-behind” everyman and everywoman at the gains made by the pointed-headed liberal intellectual types, who brushed away the turmoil of the 60s that was tearing up cities, neighborhoods and families with a condescending sweep of hand (or phrase). The common folk were presciently dubbed The Silent Majority by Nixon and his people, and this phrase captured the mood of the US electorate like no other before or since. I might add that no politician as inherently unlikeable (or as hideously paranoid and self-loathing) as Richard Nixon has done so much with so little since then as well. This book is important for the generations of us who came of age after the 1968 and 1972 elections, who have a hard time understanding – what with all we’ve been spoon-fed our entire lives about the glories of 60s protest, the Civil Rights struggle, the liberation of women etc. – how Richard Nixon, of all people, won such convincing elections in those two years. More so than in his Goldwater book, Perlstein shows his political hand pretty clearly in this one. He (mostly) appears to detest Nixon, while at times expressing admiration (of a sort) for his tactics. It mostly comes down to Vietnam, which Perlstein details, atrocity by atrocity, lie by lie, until it’s hard not to get pretty worked up by the whole thing. It’s an equal-opportunity sort of takedown of the 1960s' main players. When the book seems like it’s going to bury Lyndon Johnson and Richard Nixon for their many cover-ups and mistakes on Vietnam, it shifts focus abruptly, and buries the Tom Haydens, the Black Panthers, the Hubert Humphreys just as effectively. Hypocrisy, grandstanding, and bullying tactics get equal savaging in this book, which makes it pretty fun to read – since so many of these people seem like utter cartoons forty years later. The inner machinations of elections have never been as fascinating as they are here. The American system of government looks like a fragile African military junta as times, when one considers the power wielded by men like Richard M Daley in Chicago, or the ways in which Nixon’s “dirty tricks” committees found quasi-legal methods to undercut their opponents en route to his landslide victory in ’72. I didn’t know much about how or why McGovern was anointed at the savior of the Democratic Party that year, but now I understand how the left-wing half of the electorate felt the burning need to “go for broke” in the wake of a catastrophic Vietnam war. Also, Perlstein does a good job recounting Nixon’s despicable kowtowing to Labor in the name of more votes, which unleashed “wage and price controls” on American business, one of the worst ideas of any era, and one which made the 70s easily the worst decade in recent American economic history. While Nixon continued his law-and-order barnstorming through America’s heartland, America itself was on fire. A riot broke out in Peoria, Illinois when a black man was stopped by a cop. A construction worker in Brooklyn was heard to say, “Let’s shoot all the n*ggers”. Students were burning draft cards in Ohio. In San Francisco, the Weather Underground blew up a storage shed behind a police station. George Wallace was lecturing an audience in Alabama that contained at least 5 known Klansmen. A mysterious 4am fire in Chicago at a Labor Union office. Abbie Hoffman, on TV, telling people to kill their parents. Behind the scenes, Richard Nixon was laughing. That sort of thing. OK, that’s my parody version, but when you read the book – and I whole-heartedly suggest you invest the time – you’ll see what I mean. The book is a totally immersive plunge into the American mindset of 1964-1972, and I won’t look at that time the same way again after the experience. It’s that good, and that all-encompassing. Perlstein has the gift of being able to make the seemingly mundane pace-quickening, and despite my kidding above, does a great job capturing real snippets from the American zeitgeist to capture the mood. The United States has never been torn asunder the way it was during these tumultuous years, and never has it had a politician so good at exploiting the divisions for his own advantage. When Nixon is finally brought down, at the end – as you knew he would be – the curtain abruptly closes without a whole lot of detail on Watergate and the resignation, leaving one to wonder what Perlstein’s next move might be. The Ford era (ha!)? The Church commission, the CIA hearings, the backlash election of Jimmy Carter, followed by the rise of Reagan? Now we’re talking. I’ll spend another 750 small-type pages and many, many weeks devouring that one.